Our Independent Rear Suspension (IRS) unit is a complete replacement for the existing rigid axle, leaf springs, and leaver arm dampers. The 100mm system is designed to cope with up to 250bhp, and the 108mm system up to 450bhp, and fits around the existing body, battery boxes, and fuel tank without modifications being necessary. The installation adds to the rigidity of the cars shell and reduces the un-sprung weight by 55kilos (overall weight same as std axle), this, together with softer springs and high quality dampers, results in a more supple suspension. Unlike the original system each wheel reacts independently to the change in road surface so not upsetting the balance of the car, and the unequal length double wishbones ensure that for hard cornering the small camber change induced keeps the maximum amount of rubber in contact with the road. The system consists of a new sub-frame that supports the differential, upper and lower tubular wishbones, coil-over dampers, machined alloy hub carriers, and tie bars to the spring eyebolt location. Also attached to the sub-frame are the new stainless steel braided brake pipes and the handbrake cables. All these parts plus all the necessary polyurethane bushes, and nuts and bolts make up the basic kit. Shims, in the form of quick-change C washers, can be fitted between the wishbone pivot yokes and the sub-frame to make minor adjustments to camber and tracking. The dampers used are the same spec as our front system, the fabricated parts are black powder coated, and the aluminium uprights are anodised. In addition the differential, drive shafts, hubs, stub shafts, drive flanges and disc brakes are sourced from the Ford Sierra or Granada. The Ford half shafts require shortening to retain the standard track dimension, or we can supply them purpose made, at the correct lengths. The Ford drive flange can be used for centre-lock wheels with a bolt-on splined adapter, we supply a new flange with either MGB, C, or RV8 stud pattern for bolt-on wheels. All these Ford parts can be supplied as new or reconditioned, or can be sourced second-hand very cheaply. There is a range of differential ratios available (3.1-3.9 Sierra and 3.3-3.6 Granada). The Sierra unit has a 7” crown wheel and can cope with engine power up to 250bhp whilst the Granada’s 7.5” will happily withstand higher output engines. For those with big V8 engine cars that want to drive them hard, or use for track days or competition, both diffs can be fitted with the standard Ford viscous coupling type Limited Slip unit, alternatively a Quaife torque biasing LSD could be fitted. For vehicles over 250bhp, we recommend the 108mm IRS system (see below). Fitting the kit is straightforward, once the original axle, springs, and dampers are removed, the unit, which can be pre-built off the car, is raised into position. It is attached to the original damper mounts (4 bolts); the rear spring front eyebolt mounts via the tie bars (2 bolts): and the check strap brackets (2 bolts). The stainless brake hoses mate with the existing pipe-work and dual handbrake cables and their linkage attach to the handbrake drop link. 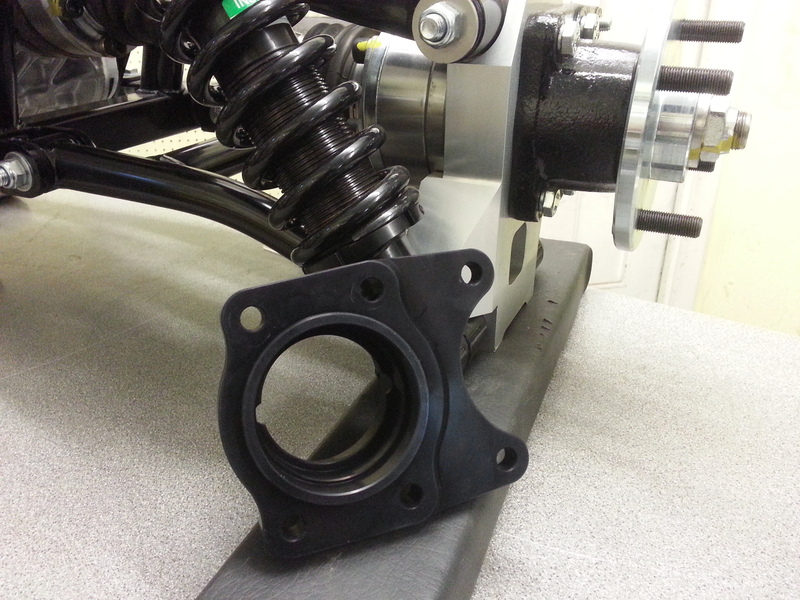 The rear suspension unit can be supplied fully built ready for bolting to your car. N.B. A minimum wheel diameter of 15 inches is necessary to provide sufficient clearance. The instructions cover setting up both suspension systems, but some customers may find this a little daunting with all the variables available to them (ride height, damping rate, spring rate, and geometry adjustments), in which case we are always available to discuss and advise from our own, and other customers’, experiences. We recommend using our 108mm system if your vehicle is running over 250bhp. The Differential Drive Flanges are 108mm in diameter, as are the stub shafts. This allows for the use of larger, stronger 31.5mm drive shafts, as well as larger, stronger CV joints, in conjunction with 7.5" diff with ATB quaife unit. 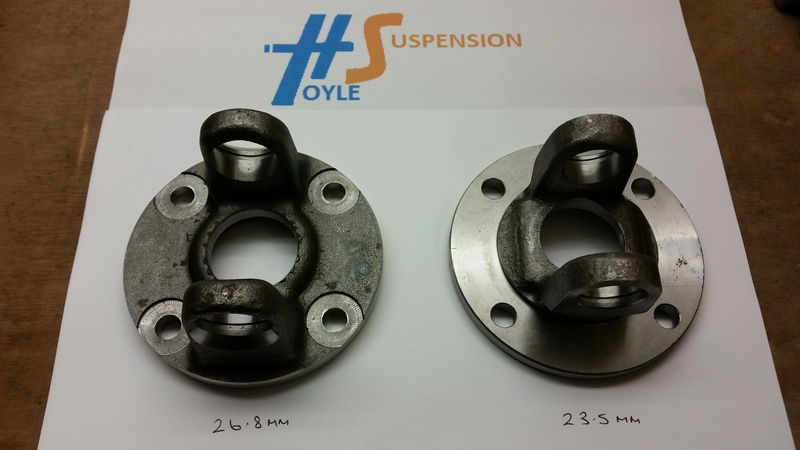 We offer lightweight HE30 Aluminium (6082T6) bearing carriers for IRS systems, reducing the unsprung weight of the IRS by 2.0kg compared to the standard steel Ford version. This makes for a notable and valuable upgrade, as the lower weight leads to a reduction of inertia, improving the handling quality. 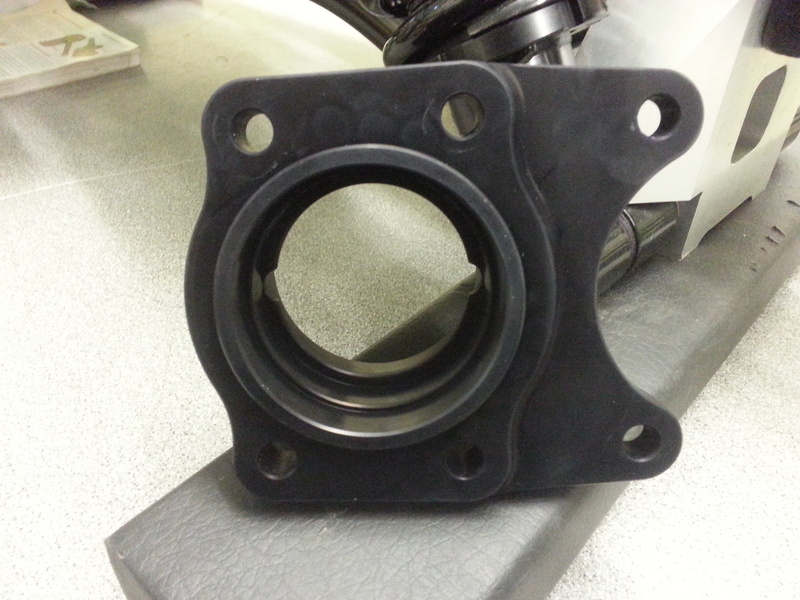 These bearing carriers include high quality bearings fitted. Ford differential drive flange does not have the same pattern as an original MG propshaft. 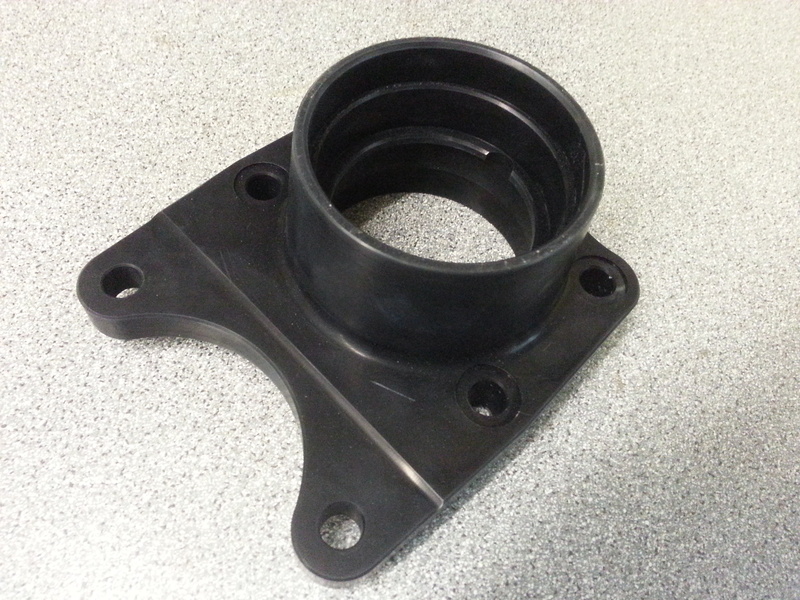 We carry in stock Propshafts to suit MGB rubber bumper using standard engine mountings and either LT77 or R380 gearboxes. 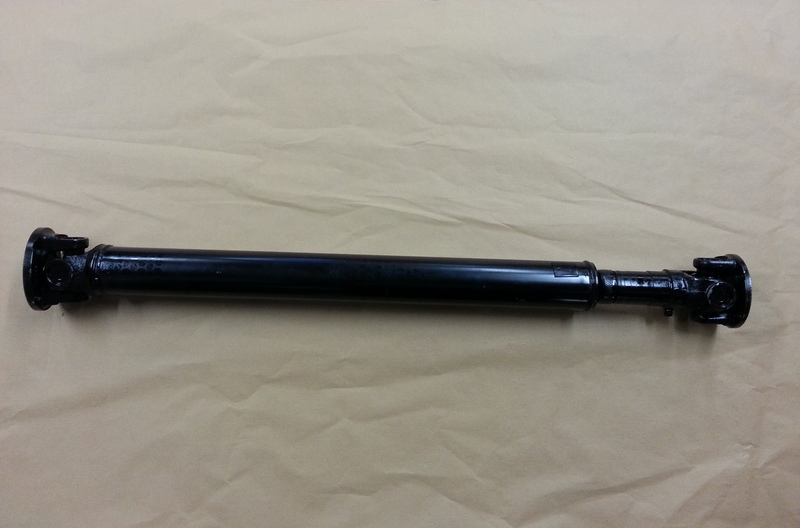 We can supply any propshaft required, from T9 to T5 and T56 Magnum. Flanges are available so that you can have your own propshaft made locally if preferred. Hoyle Suspension now offers a complete exhaust system with RV8 style manifolds, with single or twin box, and large rear box (modifications are required to the spring hanger, especially on rubber bumper cars). The main advantage of the system is that the rear section passes through the IRS, increasing the ground clearence of the vehicle. It also increase the aesthetics, as the silencer is much higher, which prevents the exhaust from looking like it is falling off, which is something many of our V8 customers have mentioned to us.